The XT-640 is a dye sublimation transfer printer designed especially for the production of colorful fashion and sports apparel. 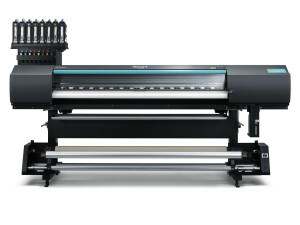 The XT-640 features dual print heads to achieve high-speed perfo rmance at a usable print speed of 41m2/h. The rail and frame structure has been reinforced to enable highly detailed printing with precise ink droplet placement. A new, more convenient Feed Adjuster at the front and back of the printer provides even tensioning and prevents skewing of the media. Optimized for textile printing, Texart ink delivers bold and vibrant colors and deep, rich blacks. Adding orange and violet inks increases the color gamut and allows for exceptional reds, oranges, deep blues and purples, while light cyan and light magenta provide subtle gradations, beautiful skin tones and a remarkably fine level of detail. ErgoSoft Roland Edition RIP software, developed especially for Roland DG by ErgoSoft, the premier RIP provider in the textile printing industry, is available with the XT-640.